Move over, tomatoes. 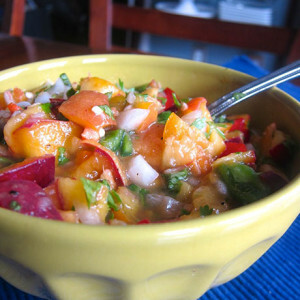 This salsa stars peaches, that sweet summer stone fruit that goes with just about anything you like. An unintended accoutrement theme has recently developed here on my blog, first with my grandmother’s coconut chutney and then with colorful red and gold salsa fresca. 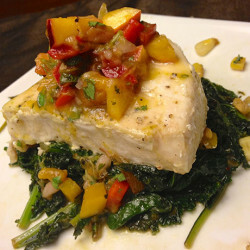 I have one more related recipe up my sleeve that I’ll share this weekend, too. What can I say? I like things saucy. 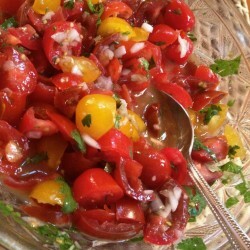 Which brings me to today’s post on peach salsa, a glorious condiment that’s perfect with a wide range of fare far beyond chips. Inspiration struck sampling the succulent peaches at my local farmers market. 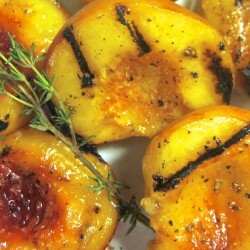 It’s super easy to prepare, so make some soon while sweet summer peaches are still around. See how I didn’t say anywhere “It’s just peachy!”?